ROOSA, Michael A. 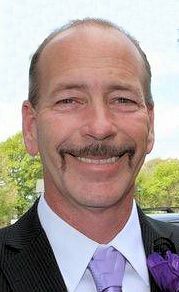 “Mike” of Brockton, formerly of Randolph, passed away suddenly on October 17, 2018, at the age of 53. Beloved husband of Kim (Kolozie) Roosa. Loving father of Shane Roosa of Henniker, NH, Tanya Dufour of Brockton, and Brittney Kolozie of Brockton. Devoted brother of Michelle Pelchat and her husband Joseph of Exeter, NH and the late Renee Roosa. Dear son of Denise Roosa of Randolph and the late Albert Roosa. Brother-in-law of Deborah Kolozie, James Kolozie and his wife Lisa, David Kolozie and his wife Roseann and the late Ronald Kolozie and his wife Christina. Devoted “Papa” of Logan. Also survived by many nieces, nephews and dear friends. Mike was born in Boston and grew up in Randolph where he graduated from Randolph High School, Class of 1984. He was a Tractor Trailer Driver for J.B. Hunt Co. in Lancaster, MA where he has worked for over 26 years. He loved car shows, muscle cars and was an avid golfer as well as an enthusiastic Boston Sports Fan. He was a former volunteer firefighter in Ware, NH. And still loved chasing fire trucks to fires. He was a handyman always willing to help unconditionally and loved his Dunkin Donuts. Mike was a good and kind hearted person who will be fondly remembered and sadly missed by all who knew him. Relatives and friends are respectfully invited to attend visiting hours Sunday, October 21st from 4:00 to 7:00 PM in the Cartwright Funeral Home, 419 No. Main St.(RT 28), Randolph, immediately followed by a Funeral Service at 7:00 PM. Burial will be Private. In lieu of flowers memorial contribution may be made in his name to Joslin Diabetes Center, One Joslin Place, Suite 745, Boston, MA 02215 or to the Brigham & Women’s Cardiovascular Center, 75 Francis St, Boston, MA 02115.